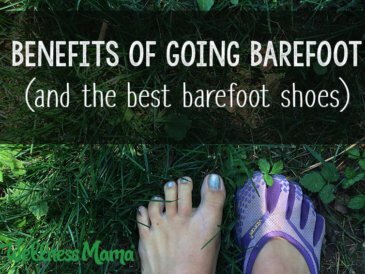 I’ve been all about the barefoot shoes (or just being barefoot) for years. But there are some times and some places where barefoot shoes just won’t cut it. 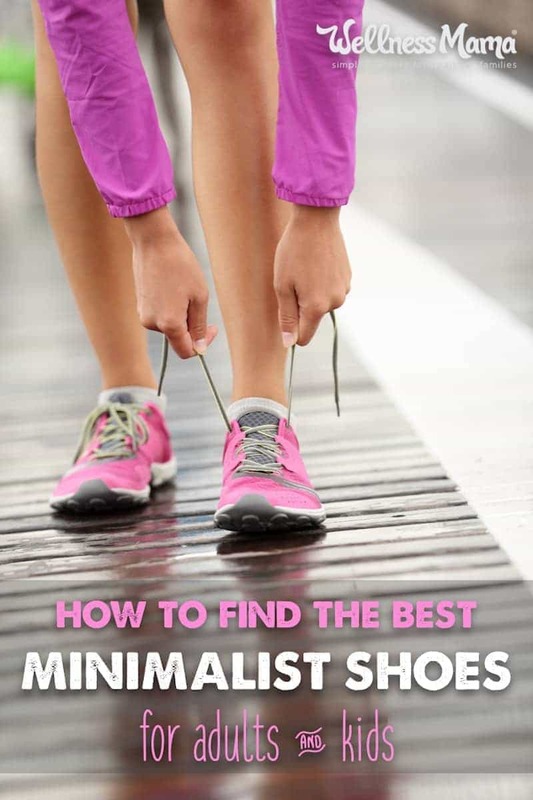 Thankfully, there are now many wonderful options for minimalist shoes that look like “regular shoes.” These shoes don’t offer quite as much foot freedom as true barefoot shoes do, but they can be socially acceptable in almost any instance while still supporting natural foot movement. Turns out that just like many other aspects of life that we take for granted (like mobile phones, fast food, and bottled water), our shoes can often do more harm than good. There are entire books that talk about the problems associated with long-term use of positive heel and overly supportive shoes. 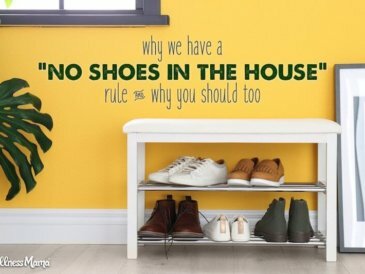 As we spend (or should spend) at least half of our day on our feet, our footwear options can affect us more than we realize! Why Are We All Wearing Heels? Walk into any popular shoe store. Over 90% of the shoes have heels! It’s easy to think that only women’s high heeled shoes are “heels,” but almost all shoes are these days! A shoe with a heel is technically when the heel is higher than the toe of the shoe. Even “flats” and athletic shoes often have 1/4 to 1/2 inch heels! First, for the purpose of this illustration, I’m assuming that people generally want to stand up straight. If you prefer to walk with your body at a 45 degree forward angle this doesn’t apply to you. Pretend a person is standing with flat feet on the ground. The ankle joint is at a 90 degree angle. Now imagine that this person is temporarily frozen so no joints can move. Now imagine we put heels on that person (or even just put a wedge under that person’s foot). Since the ankle can’t bend, what happens to the rest of the person? Ten points if you said his or her body leans forward! And the higher the wedge/heel added, the more forward the person leans. But since we don’t like to (and can’t) walk around like that, what does a person do? Unfreeze the person and he or she adjusts and stands up straight. But not without changing angles of the ankle and thus the pressure on the knees, hips, and even pelvic floor. And the smaller the person, the bigger of a problem this is! Kids are short, but they also have short feet, which is why it drives me crazy to see a child’s shoe with a heel the same height as their parents’. The short foot of a child “magnifies” a heel’s effect—even a heel of seemingly inconsequential height. Which means that… the angle between the standing surface and the foot would be much greater in the child than in the adult. Another problem with a lot of non-minimalist shoes is the overage of cushioning. In many shoes, we don’t feel the ground at all! Ever stepped on a rock in your running shoes? Did you feel it through your shoe? Supportive and cushioned shoes encourage the wearer to land on the heel of the foot when walking or running, since the shoe absorbs the impact. This changes the natural step and posture (watch babies who have just learned how to walk to see the difference!) and creates a different walking pattern. Lieberman and colleagues analyzed the running styles, or gaits, of five groups of people — U.S. adult athletes who had always worn shoes, Kenyan adult runners who grew up barefoot but now wear cushioned running shoes, U.S. adult runners who grew up wearing shoes but now run barefoot or with minimal footwear, Kenyan adolescents who have never worn shoes, and Kenyan adolescents who have worn shoes for most of their lives. As nothing in the body exists in isolation, altering a person’s walking pattern will have an impact on joints above the foot (mainly knee and hip) as well. Even things like arch supports, which seem like a good idea, are controversial in the foot world. Some experts recommend them routinely. Others claim they can actually cause the problem they are meant to fix by over-supporting the arch and causing the muscles in the foot to get weaker from lack of use. Going barefoot or wearing minimalist shoes that allow natural movement strengthen the muscles of the feet and legs by requiring balance and stabilizing movement. This also may reduce injury risk if done regularly and carefully. Some evidence shows that many ankle and knee problems may be linked to the artificial way of walking created by overly-supportive shoes. Simply changing to more natural footwear options can help alleviate these problems. Less supportive shoes may help strengthen the arches by requiring the muscles of the foot to hold up the arch instead of providing support that causes the muscles to atrophy. Walking barefoot (or in barefoot shoes) can lead to a more natural gait. Barefoot walkers often mid-foot strike rather than strike with the heel (often seen with cushioned shoes). Removing the heel lift of most shoes helps the Achilles tendon and calf muscle stretch and lengthen. Some experts say this may reduce injuries, such as calf pulls or Achilles tendinitis caused by short, tight tissues. So, if our feet aren’t meant to be confined to cushy rubber soles all day but social norms frown on walking barefoot in most places, what are the alternatives? Is Zero-Drop – This means that the heel and the rest of the shoe are the same height. This one requirement makes minimalist shoes surprisingly hard to find! Bends Easily– The foot is designed to bend when we walk, not just our ankles. Stiff shoes don’t allow this natural movement of the foot. Doesn’t Squish Toes– When we walk barefoot, our toes spread out to improve balance and stability. Shoes that squish the toes restrict this natural movement. Minimalist shoes have what is called a wide toe box to allow toes to move, even in the shoe. 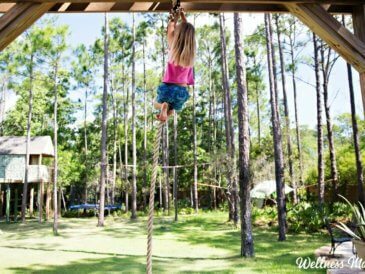 While in an ideal world, we would all have the chance to walk around barefoot in perfectly soft green grass every day, this certainly isn’t always the case (though if you have the option to, go for it!). For those of us used to wearing cushioned, protective and heeled shoes, switching to barefoot and barefoot alternatives requires a careful adjustment period to make sure that the muscles of the feet and legs have time to adjust. This book explains how to do it safely. 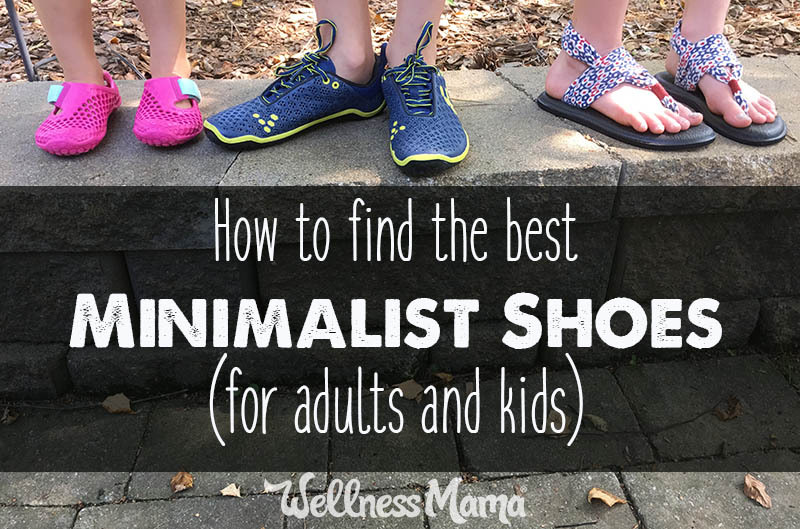 Thankfully, there are some great barefoot and minimalist shoe options available. The following are the ones our family wears (for sandals and barefoot shoes see this post). This company makes a wide variety of minimalist shoe options for all ages. All of their shoes satisfy the criteria above. They carry the only great option for men’s dress shoes I’ve seen. I also love their kids dress shoes, sneakers, and women’s flats. For littles, their Ultra kids’ shoes are great. Pros: Many great options for dress shoes, athletic shoes, and casual shoes. Cons: Pricier than traditional shoes. Where to get: I find the best prices on their website here. Sizes & Styles Available: All sizes from toddler to adult. All styles from dress shoe to sandal to athletic shoes. This company also makes minimalist footwear that meets the criteria above. I really only like their Teva-style sandals, but they have some sneakers as well. Cons: Not a lot of styles. Don’t love their sneakers. Where to get: I always order styles with free returns from here so I can try them on. Sizes and Styles Available: Adult sizes only. Sandals and sneakers. 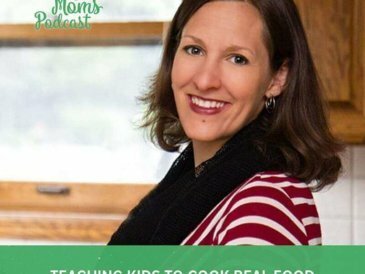 These are specifically recommended by Katy Bowman as a really budget-friendly minimalist option. They are really inexpensive (around $10) and great for growing feet. 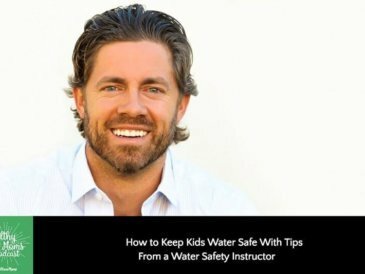 We often get these during the summer, especially for younger kids who outgrow shoes quickly. Kids love these colorful water shoes and there are some really cute adult ones as well. Pros: Really inexpensive, fun patterns for kids, versatile. Cons: Not as durable as some other options and not very trendy. Though not specifically designed as a minimalist shoe, TOMS classic shoes are actually a decent option for those wanting a “normal” looking shoe that doesn’t offer too much cushion or have a positive heel. They are also incredibly comfortable, and apparently pretty popular. I like that they also donate shoes to those in need around the world. TOMS certainly aren’t the best option, but they offer most of the benefits without being too weird. Pros: No positive heel. Minimal arch support. Protect the feet. Lots of options. Cons: Not for working out. Slightly constrict toes. Do have some cushioning and won’t necessarily help correct a heel strike. Sizes and Styles Available: Stick with the classic flats and avoid any of the newer styles with a raised heel. Available in adult and kid sizes. These aren’t the best option but they are really comfortable and seem to be popular. They have more cushioning than some of the other options, but hold the foot and have a flat sole. Thanks to researchers like Katy Bowman and Dr. Lieberman at Harvard, we are starting to understand how modern footwear is negatively affecting how we move. As more companies create minimalist shoe options, it will get easier to find alternatives to traditional heeled shoes. When possible our family chooses minimalist alternatives and also makes sure to spend time barefoot! Have you tried any of these shoes? What are your favorite shoes and why? Haven’t yet, but will? Share below!